No matter how much your air conditioner operates, it’s important to perform routine maintenance that keeps your system running efficiently. If something goes wrong, you’ll be better able to troubleshoot the problem. Your knowledge will also help you make smart choices when the time comes to replace your air conditioning system. 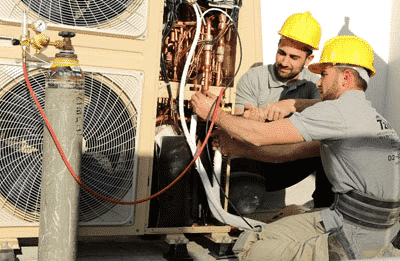 In this article, we’ll focus on the most common system installed for homes in Israel, a split system.As the name suggests, the split system air conditioning unit is split into two — the outdoor unit and the indoor units. Air is blown over the coils on the indoor unit. The outside unit is known as the condenser unit. Air conditioners don’t actually “produce” cold air the way a furnace produces heat. Rather, they use a chemical called refrigerant to absorb heat from the air inside your home and carry that heat outside where it is released. The evaporator coil is located inside the indoor part of the system and has coils that easily conduct heat. These coils form panels which are lined with thin pieces of metal known as “fins,” which bring the air to be cooled closer to the coils and maximize the effect of the refrigerant. As the air conditioner runs, the compressor pulls cold, low pressure liquid refrigerant through the tubing in the evaporator coil; Before entering the evaporator coil, the refrigerant passes through the expansion valve. This valve relieves pressure from the liquid refrigerant, which rapidly cools it. The liquid refrigerant leaving the expansion valve is quite cold, which is what allows it to absorb heat from the air. The expansion valve also controls exactly how much refrigerant flows to the evaporator. More advanced expansion valves, such as thermostatic expansion valves (TXVs), can minutely control the flow to improve the system’s overall energy efficiency. As the refrigerant flows, the blower fan draws hot room air over the evaporator coil. The refrigerant absorbs heat from the passing air and, as it is absorbed, it warms up and evaporates. When the humidity in your home air hits the cold evaporator coils, the water vapor condenses into liquid form and drips down into the condensate pan, which drains the water away. This is how your evaporator coil reduces the humidity in your home. Learn about Caring for the Evaporator Coil. WHY CHOOSE A HIGH-EFFICIENCY INVERTER SYSTEM? Air conditioning systems typically consume the most energy in a home and are consequently the largest component of the electric bill. While high-efficiency inverter systems cost more than fixed speed systems, the long-term savings make them a very wise investment. Some super high-efficiency systems can cut your electrical usage by as much as 70 percent! In this scenario, the higher installation cost of the High efficiency Inverter is offset by energy cost savings in about two years. Central air conditioning can be inexpensive to install. The system consists of an outdoor unit that uses ducts to connect to indoor units in individual rooms. The installation costs will be substantially impacted by how much ductwork is required to connect all the rooms. Typically, central air systems can be installed in less than a day. While central air can be inexpensive, if it is done correctly, it can quickly become expensive as extensive ductwork is needed to provide each room with a supply and return. This will be explained further on. Individual units initially cost more than central air systems because each room has its own independent unit and thermostat. Individual units can be piped to a single outdoor condenser unit like a VRF system, or each room can have its own outdoor unit. Installing and maintaining individual outdoor units for each room will be more expensive than installing a VRF single outdoor unit. The cost of operating a central air system is directly related to the type of space for which it is being used. With central air, the entire home, floor or area is heated or cooled according to the temperature specified on a centrally located thermostat. If the system is being used in one open space, it can be cost effective. It is best suited for large open areas such as living rooms, great rooms or any floorplan where a uniform temperature is desired throughout an entire area. However, with ducts, as much as 40 percent of the cool air is lost in the ducts before it reaches the rooms. The system produces less cold air than is actually needed. If the system is being used in a space that has more than one room, it becomes more expensive to operate. This is because the temperature in individual rooms cannot be controlled. The system ends up working to reach the desired temperature in each room regardless of whether it is needed or not. The system is either on or off for all of the rooms. The result is a less efficient system that costs more to operate. While individual units are initially more expensive than central air systems, they cost less to operate on a long-term basis. This is because room temperatures are independently adjusted rather than adjusting the temperature for all rooms regardless of whether or not they are in use.You save money by only running the system in the rooms that you choose. Since you are able to control the temperature of each room and only use the power that you need, the result is a more efficient system that costs less to operate. Lastly, each room receives all of the cold air being produced, as nothing is lost in the ducts. Since central air systems are controlled by a single thermostat placed in a central location, the temperature cannot be adjusted for individual rooms. Additionally, the rooms located furthest away from the thermostat may not be sufficiently cooled or heated. The lack of individual room controls means that when one room needs extra cooling power, i.e, the kitchen — to compensate for the additional heat caused by cooking — all other rooms will also be affected by adjusting the thermostat. Individual units are great for spaces that have multiple rooms requiring different temperatures. If you want to cool down your kitchen while cooking without simultaneously blasting cold air throughout the other rooms, you are able to easily do so with this system — and it is cost effective. Individual units are engineered to have the proper amount of cooling/heating power specifically for the room in which they are installed. The thermostat can be set to meet the needs of the person or activity in the room. If the room is unoccupied, the unit can be turned off. This level of control on a room-by-room basis saves money because you are only using energy in the rooms that you choose. Why pay to cool an entire home if you are only using one or two rooms? For air conditioning to work properly, it requires circulation. In order for cool air to flow into a room, the air that is already in the room needs to circulate out. If the air doesn’t circulate, the room becomes pressurized and cannot accept the new cool air. Central air systems have powerful blowers that force air through ducts and into the room. Ducts are also used to return air back to the system. For multiple rooms to work properly, each room must have a separate return duct or air path so that the air can leave the room and return to the system. For multiple rooms to work properly, each room must have a separate return duct or air path so that the air can leave the room and return to the system. Individual units have smaller, less powerful blowers than central air. This is because they do not need to force the air through many meters of ductwork the way that central air does. Each room has its own fully contained system. Since each system has its own dedicated supply and return, individual units have better air circulation than central air systems. Cleaning your air conditioning filters once a month will reduce your energy bill and help prevent costly repairs. Dirty filters cause the system to work harder which puts a strain on the motor. Central air systems operate with one single air handler for the entire home or floor. The air handler pulls air from all the rooms, and removes dust and pollutants by sending it through a washable mesh filter. The clean air is then sent through the system before being forced back into each room. When central air is used in multiple rooms, the ductwork typically extends for many feet. The washable filter does not trap all of the dust and pollutants. Whatever is not trapped is sent back through the ducts and can eventually make its way into each room. For the best air quality and performance, filters should be cleaned at least every other month. It is also recommended that ducts be cleaned every few years to remove the trapped pollutants. Individual units tend to have better air quality than central air units mainly because each room has its own complete self-contained air handling system. Similar to a central air system, the air handler pulls air from all the rooms and removes dust and pollutants by sending it through a washable mesh filter. The clean air is then sent through the system before being forced back into each room. Individual units have a small air channel that can be easily cleaned with a damp rag. Regular cleaning will help keep the air free from dust and pollutants as it passes from the unit to the room. For the best air quality and performance, filters should be cleaned at least every other month. When deciding on the appropriate-sized air conditioner for your situation, it is important to consider what you want to achieve. The cooling capacity of an air conditioner is typically measured in Israel as “סוס חוכ” (a סוס חוכ is equivalent to 9,000 BTu/h). If you get a system with too low a סוס חוכ rating, the system will work too hard and use excess electricity attempting to reach the desired room temperature — which it will never achieve. On the other hand, if you get a system with too high a סוס חוכ rating, the system will cycle on and off too quickly and will fail to properly condition the air. The result is an uncomfortable, humid, cold room and extra wear on certain parts of the system. An important consideration is that systems with inverter technology can be comfortably oversized — for those occasions and times that you will want extra power without a problem, as they are able to modulate their output depending on the needs of the room. WHAT CAN I DO TO REDUCE MY AIR CONDITIONING COSTS? Keep your filters clean and have your system professionally cleaned once a year. 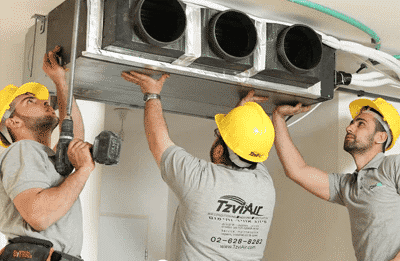 With a TzviAir home maintenance plan, you’ll lower your monthly energy costs and have a more efficient air conditioning system that will last longer. If you plan to move in the near future, your best option is to repair your unit. However, if you plan to be in your home long-term, an investment in an energy-efficient system that can cool your home while cutting costs is your best option. Additionally, central air systems that are over 10 years old should be replaced with a VRF system that can save up to 75 percent on the electric bill! This depends on what how much use your system gets and your home environment. Most filters should be cleaned at least every two months. TO WHAT TEMPERATURE SHOULD I SET MY THERMOSTATS? The temperature at which both you and the utility bills are comfortable. Each person has their own comfort zone and budget. HOW LONG IS MY SYSTEM GOING TO LAST? If your unit is properly installed and regularly maintained, it should last between 10- 15 years, VRF system should last longer. However, it is important to keep in mind that as systems age, their efficiency drops and as technology advances, new systems are far more efficient than they were years ago. So, while a unit might work fine, it might save you money to replace it with a more efficient system. WHEN IS TIME TO BUY A NEW UNIT? If your current system uses excessive energy, performs poorly even after cleaning or requires frequent repairs, it may be time to consider a new, energy-efficient system.